For the purposes of home theater, equalization can be divided into two areas. Subwoofer equalization is used to smooth the low-frequency response of the system, and covers the frequency spectrum from 20 Hz (or lower) up to about 120 Hz, depending on the specifics of the system. The goal is greater accuracy: what you hear at the listening position is closer to what the recording engineer intended. Full-range equalization covers the frequency range above that handled by the subwoofer. It compensates for response variations caused by acoustic reflections and by compromised speaker placement, such as against a wall or into a cabinet. Center and surround speakers in particular are prone to response errors caused by design and placement limitations. Equalizing all speakers in a home theater system to have the same in-room frequency response will ensure optimum creation of soundstage and envelopment. 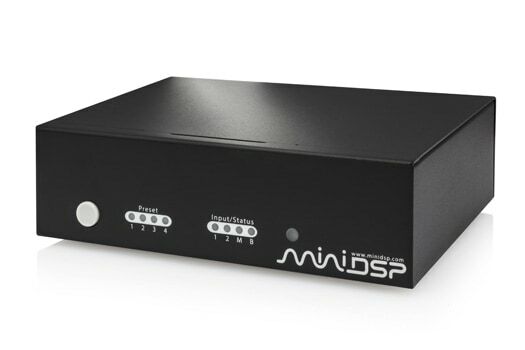 A miniDSP nanoAVR HD or nanoAVR HDA (analog outputs). This diminutive unit is the "powerhouse" that we'll be showing you how to use in this app note. The diagram below illustrates a typical setup used for acoustic measurement. The computer can be connected to HDMI Input #2, so there is no need to disconnect the player connected to HDMI Input #1. The computer will need an HDMI output port, or if you have a Mac with a Thunderbolt port, then a Thunderbolt to HDMI adapter cable can be used. Turn off all bass management and down-mixing. Typically this is done by setting all speakers to "large" (even the ones that don't exist). Set all channels to the same level (typically, 0 dB). Turn off all forms of matrix decoding (e.g. Dolby Pro Logic, DTS Neo:6) and any surround simulation or enhancement modes. Set the volume control on your AVR fairly low to start with, and use the HDMI output channel selector (REW Preferences on Windows, SoundFlowerBed on Mac) to send audio to channel 1. You should hear a hissing sound from the front left speaker. Then use the HDMI channel selector to proceed through each channel in turn. Use REW to measure the in-room frequency response of each of your speakers and subwoofer, one at a time. (You don't need to run a measurement on channels that are down-mixed to other channels.) For best results, point the microphone towards the speaker being measured. Performing this baseline measurement ensures that your setup is ready to proceed with equalization. In some cases, the baseline measurements may reveal issues that will need to be corrected before proceeding. For example, if the subwoofer response has a deep notch, no amount of equalization will be able to correct it and you should try some other positions of the subwoofer in the room. Start by equalizing the front left and right speakers. These are usually the highest quality speakers in the system and have fewest placement problems. The goal when equalizing these speakers with an in-room measurement is to obtain a fairly even response that gently slopes down from low frequencies to high frequencies. Important items to set are the MiniDSP-96k button (the nanoAVR operates internally at 96 kHz), the settings related to the HF Fall, and the Match Range frequencies. Use boost filters sparingly. If used, they should have a fairly low Q (1 or less) and a moderate amount of gain (4-5 dB max). Don't try and use a narrow boost to fill in a deep notch in the response. View measurements at 1/3rd octave smoothing as a general rule. Switch to 1/12th octave smoothing to check that you are not attempting to correct a narrow dip or peak with a broad filter. Even with negative gain, use high-Q filters carefully. If there is a persistent resonance that you can measure in different locations in the listening room, it may be an architectural issue (such as a corridor or stairwell), in which case a narrow filter can help. Avoid using EQ to increase the amount of bass from your speakers — leave that to the subwoofer. Your speakers have a natural low-frequency rolloff and trying to change this by too much is a recipe for overdriving amps and woofers. Make some additional measurements with the microphone in different locations around your seating area. This can be used as a "sanity check" to ensure that you are not equalizing for issues that vary a lot over the seating area and that you are not "over-equalizing." Now move on to the center and surround speakers. The goal with these is not only to even out the frequency response, but to also get approximatelythe same in-room frequency curve as the front left and right speakers. You may find that high-shelf and low-shelf filters are particularly useful for this purpose. Also, use the gain adjustment on these channels so that the levels match the front speakers. Due to placement issues, the frequency response measurements of the center and surround speakers, even after equalization, will likely not be as smooth as the front left and right speakers. This is OK — you don't need to get the curves perfectly smooth, just get to a reasonable compromise. To equalize the LFE/subwoofer channel, use the auto-EQ function of REW. This is described in detail in the app note Auto-EQ tuning with REW, so that procedure should be followed carefully. The key difference is that the Equalizer setting must be set to "miniDSP-96k", since the nanoAVR operates internally at 96 kHz. Remember also that the better the response of your subwoofer before equalization, the better the result will be afterwards. Subwoofer response is very sensitive to placement within the room, so experiment with different subwoofer locations in order to achieve the best final result. If you have full-range (20 Hz to 20 kHz) speakers all around (front left and right, center, and all surrounds), then your job is done! You can sit back and listen. In practice, very few home theaters have a full suite of full-range speakers, and so bass management is required to send low frequency content to the subwoofer. We will cover this in the app note Bass Management with the nanoAVR. You can continue to fine-tune your system while listening. For example, set up some high-frequency shelving filters to get the overall tonal balance that you prefer. Adjust the level of the subwoofer channel to get the best balance of bass. And so on. In the end, it's really all about how the system sounds to you. Have fun!